The Golden State Warriors are going back to the Finals for the fourth straight year. Kevin Durant scored 34 points and Steph Curry added a near triple-double with 27 points, nine rebounds, 10 assists and four steals as the Warriors beat the Houston Rockets, 101-92 to take Game 7 of the Western Conference final. If you thought the Boston Celtics had a tough shooting night from downtown in Game 7 of the Eastern Conference finals, that was nothing compared to the Rockets' cold streak. The most prolific 3-point shooting team in the regular season, the Rockets tossed up their usual high number of shots from behind the arc. Unfortunately they only got six to go down, finishing a putrid 7 of 44 (15.9 percent) from 3-point land. At one point they missed 27 straight 3s, setting a new record for the most consecutive missed shots from downtown in a playoff game. It would be one thing if they shot like that and lost by 20-plus points, but to have a historically bad shooting night and only lose by nine points is pretty heartbreaking. Obviously it's not as easy as just adding points, but consider that if they shoot even just 12 of 44 -- still a pretty bad night -- they win by six. Just four minutes into the game, Klay Thompson picked up his third foul, and had to go to the bench for an extended period of time. He finished the game with just 19 points. Another of their All-Stars, Draymond Green, went 5 of 13 from the field with five turnovers. And yet, despite two of their best players having sub-par performances, it never really felt like the Warriors were in trouble. Because, well, they just had two more All-Stars -- specifically, two of the best three players in the world -- available to throw at the Rockets. And boy did Kevin Durant and Steph Curry deliver. K.D. 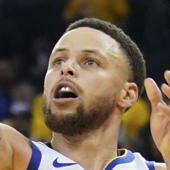 finished the night with 34 points, five rebounds, five assists and three blocks, while Curry nearly recorded a triple-double, going for 27 points, nine rebounds, 10 assists and four steals. That's what makes it so hard to beat the Warriors four times in seven games. With four different All-Stars, they always have someone ready to step up if others are struggling. It was devastating to see Chris Paul have to sit on the bench, able to do nothing but watch as his team's lead, and his chance at a first ever trip to the Finals, evaporated at the hands of the mighty Warriors. And with how the last two games went down, it's hard not to think of what might have been for the Rockets if CP3 hadn't gotten hurt. In each of the last two games, the Rockets took big leads early, then faded down the stretch as their shots stopped falling, they started to get tired and they lost their composure a bit on both sides of the ball. Those were the problems that plagued them last postseason, and the ones Paul was able to stymie this time around. He was not only a floor general, keeping the team in check when things started to go against them, but he could put he was their backup plan for stretches where Harden needed a rest or their 3s weren't falling. In short, they got him specifically to win games like Game 7. Sports are a cruel thing sometimes.